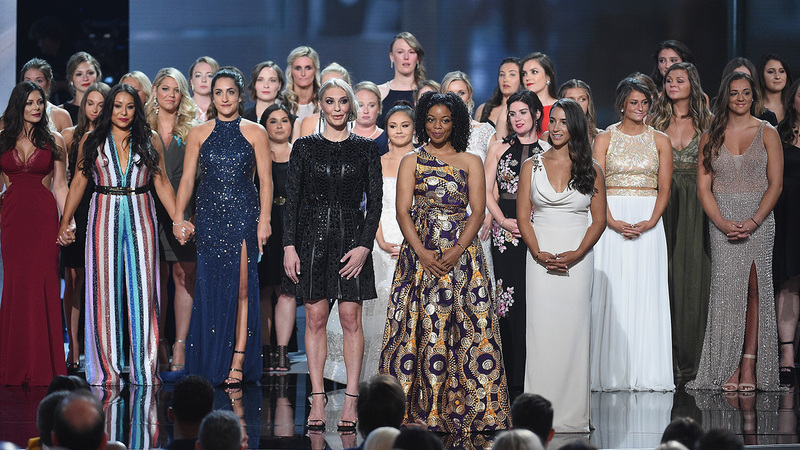 Aly Raisman, Sarah Klein, and Tiffany Thomas Lopez, took the stage along with 140 other survivors from Larry Nassar’s abuse at the 2018 ESPY Awards on Wednesday and brought down the house with their emotional and powerful words about taking down abusers in the athletic world. The three women, surrounded by their fellow sister survivors, recounted the 30 years of abuse that women suffered at the hands of doctor, Nassar, while USA gymnastics and Michigan State University ignored their claims. Klein, who was first abused by Nassar three decades ago, began their tribute by thanking the ESPYS and the Arthur Ashe Family for honoring survivors of abuse. She then went on to tell the world that it was one woman — Detective Lieutenant Andrea Munford and the Michigan State Police Department- -who finally investigated their claims. Raisman also spoke out about how their story has impacted others. Lopez, a softball player, said more people need to become more comfortable with uncomfortable topics like sexual abuse.